Well, the title of this post kinda gives the game away! I’m doing a very happy dance, as I’m in! 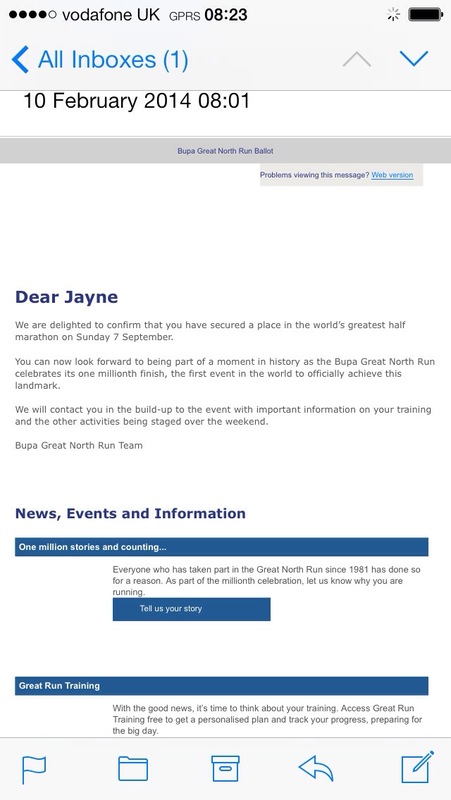 I secured a place in the Great North Run! Squeeeeeeeeee! It’s one of those races that I watch on TV every year, and wish I was participating. And this year, I will be! Unfortunately, @TheWelshWookie didn’t secure a place 😦 so, I’ll be running myself. But I can’t help but be excited! For anyone who has run it before, any tips? It’s nice to see how a couple of the bloggers I follow have received their confirmation for the race. Congrats! I used to always watch this race on tv back when I lived in Ireland/Scotland. It’s definitely one of my bucket list races. So pleased you are getting to do something you’ve always wanted to do! Thanks! I’m surprised I got in, but I’m delighted! Congrats! I’ve never heard of that race, but it sounds cool! Ooh exciting! A great warm up for your marathon and a completely different atmosphere to enjoy. I love big races and this one’s on my bucket list too! Thanks! I’m looking forward to it already!